Discuss the contributions of Ancient Greek teachers/philosophers (e.g., Socrates, Plato, Aristotle) whose thinking contributed to the development of their own and later civilizations. File cards with one philosopher’s name on each card, such as Socrates, Plato, Aristotle, Epicurus, Zeno, Democritus and Pythagoras. Use the globe to show where Greece is today. Explain, “The Greek civilization began in the 8th century BCE (Before Common Era). There are still practices and ideas from the ancient Greeks that we use today. The idea of a democratic government started with the Greeks. The Olympic Games, which spotlight amazing athletes from around the world, began in the Greek civilization. Marathon races, peer juries, architectural design, the Hippocratic Oath (ethical standard of care by physicians), new math practices, philosophy (evidence-based reasoning regarding life) and an screw-type invention for irrigation and wastewater removal all were things developed in these ancient times." 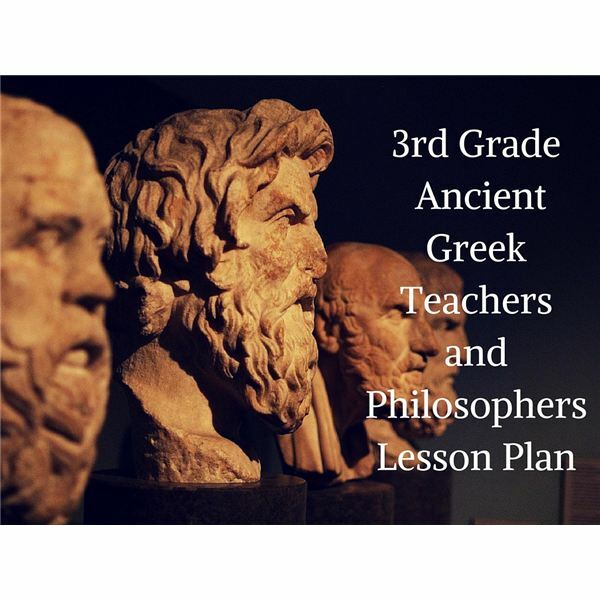 Tell students, “Today we are going to learn about some of the more famous Greek teachers and philosophers from this long ago time period. These men were thinkers and seekers of wisdom. They studied many subjects and asked questions about everything. They invented science and philosophy." Arrange students in small groups. Place the prepared index cards face down on a table. Ask one student from each group to choose an index card. This will be the name of the person the group will study. Find information about the person. Takes notes. Imagine that your famous philosopher is speaking at a big convention. Create a poster advertising the event. The poster should be neat, colorful and informative. Items could include drawings of tools the person may have used, maps, statues, photos, words or phrases. Plato- Wrote The Republic, which described a Utopian society. Founded the Academy in Athens, which is one of the first known universities. Aristotle- Taught Alexander the Great. Aristotle was one of the first to classify animals. Studied many of the sciences. Epicurus- Thought a simple, peaceful life was the path to happiness. He educated slaves and women, which was unheard of at that time. Socrates- Believed that people should question everything. Created the Socratic Method, a question and answer technique. He was convicted of criticizing the government. Democritus- Advocated for democracy, equality and liberty. He believed that all matter is composed of atoms. He thought there were other worlds besides Earth. He thought people should take up arms to defend themselves. Pythagoras- Developed the Pythagorean Theory in geometry. He believed the world was based on mathematics. Legend says he was the first to think the world was round. Zeno- Developed a philosophy called Stoicism, which suggested that happiness comes from accepting things in life, good or bad. Turner, Tracey. Hard as Nails in Ancient Greece. Crabtree Publishing Company, 2014. Catel, Patrick. What Did the Ancient Greeks Do For Me? Heinemann Library, 2011. Usher, M.D. Wise Guy The Life and Philosophy of Socrates. Farrar Straus Giroux, 2005.